The Earth's atmosphere and clouds absorb and emit infrared (IR) radiation (sometimes called "heat" radiation). This is the source of the Earth's so-called "greenhouse effect", which both makes the Earth's surface warmer than it would otherwise be, and also allows the atmosphere to cool to outer space. The main greenhouse gases are water vapor, carbon dioxide, and methane. Here we look as some of the everyday consequences of the greenhouse effect in action. 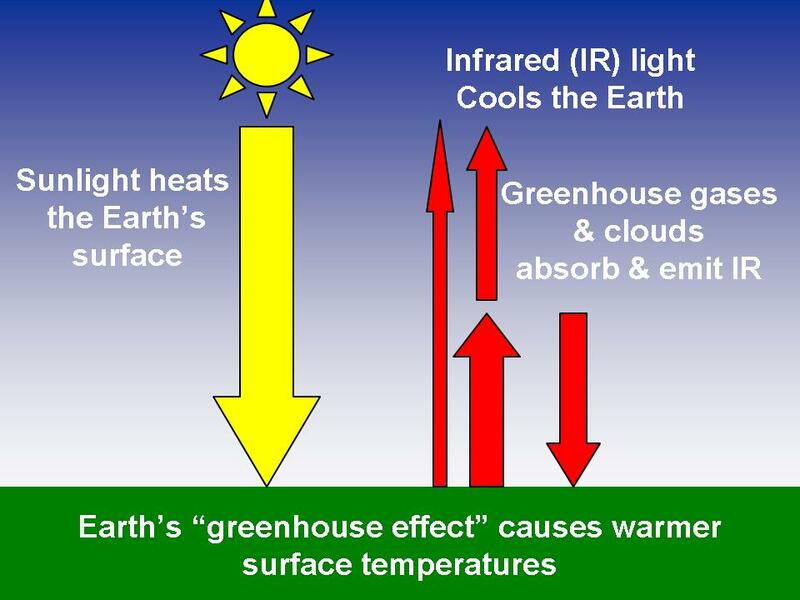 Most people don't realize that without the greenhouse effect, we would not have weather. Without greenhouse gases, the atmosphere would not be able to cool in response to heating from the solar-heated surface below. The atmosphere would warm to a vertically-uniform temperature, which would inhibit vertical air currents, which are ultimately what drive most of what we perceive as "weather" (clouds, precipitation, wind, etc.) Instead, the different layers of the atmosphere absorbing and emitting IR radiation cause a destabilization of the atmosphere, with strong warming of the lower atmosphere, and strong cooling of the upper atmosphere. This drives vertical air currents, and causes weather. Without the atmosphere emitting large amounts of IR radiation downward toward the surface, nighttime temperatures would be much cooler than we observe. For example, in deserts where there is little water vapor in the atmosphere (Earth's main greenhouse gas) nights can become very cold. Most people have experienced the warming effects of clouds at night, that is, cloudy nights tend to be warmer than clear nights. This is because the intensity of IR radiation emitted downward by clouds is greater than that of the clear atmosphere. The most dramatic example is a cold winter night when clear skies give way to increasing clouds. The resulting warming can cause a temperature increase of 10 or 20 deg. F.
A backyard greenhouse effect experiment.